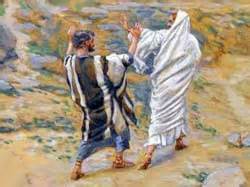 Jesus rebukes Peter for thinking as men do, not as God does. This makes sense since 1) Peter is human and thinks in human categories and 2) Jesus just acknowledged that he is the Messiah who was promised, and yet a moment later said that he would be rejected, suffer, and die. And if we’re honest, 2,000 years later we're not a lot better at wrestling with ideas of Jesus and Isaiah that a Servant of Yahweh should suffer. We might believe it for Jesus, but we don’t much accept it for ourselves, for people we know, or for the Church or the world as a whole.